Steve Kinniburgh conceded Corby Town’s performance was “miles away” from where it should be after they suffered a shock 4-1 defeat to Welwyn Garden City at Steel Park. The Steelmen were without strikers Elliot Sandy and Steve Diggin who were absent for personal reasons while Northampton Town youngsters Camron McWilliams and Jack Newell were still missing due to injuries. But Kinniburgh made few excuses for the players who were tasked with trying to secure a third win in a row as they were eventually well beaten while Connor Kennedy was sent-off late on. Corby are now guaranteed to finish third in the Evo-Stik League South Division One Central and will have a home play-off semi-final on May 1, effectively leaving their remaining matches as dead rubbers. But Kinniburgh insists that was no excuse for what his team served up on this occasion. “I don’t think there is any beating around the bush, I think we could all see that it was miles away to be honest. “It looked like a game in the middle of April when you have nothing to play for and it’s a very dangerous thing to get caught up in. “If you get into a situation where you can’t really move position - we are third and we are in the play-offs - then this can happen. “It’s my job to sort that out and quickly. I have got a week to sort it before the couple of games over the bank holiday weekend. I have got a lot of work to do. “Throughout the season we have played 40-odd games and for the vast majority of them, the game plan has been good and we have not really deviated away from it. “The players who were out there were more than capable of performing to the right levels but the boys that have been selected haven’t done it. They have disappointed me, the supporters and everybody else at the club. “They have got to find the consistency. We can’t go and have those good performances at Alvechurch and Stockport and at home against Bromsgrove and then have something like this or Barton Rovers. “We have had three or four performances like that and it’s not really good enough to be honest. Kinniburgh, meanwhile, confirmed the club will be looking closely at the footage of the challenge that led to Kennedy being given his marching orders in the second half. 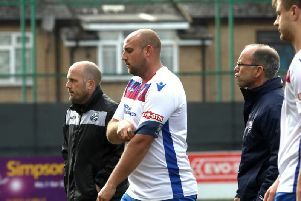 The Corby boss added: “From where I am standing, he has won the ball. He believes he won the ball. “So we need to have a look at it and that’s why we have someone filming the games, it gives us a chance to have a look back at it.